The Hollywood Theatre at Portland International Airport is a free 17-seat free microcinema showcasing short films by Oregon filmmakers post-security in Concourse C. The program is updated quarterly. To submit your film for consideration, visit The Hollywood Theatre’s Film Freeway festival page. The mission of the Portland International Airport Art Program is to provide a portal into the dynamic cultural life of our region and provide a showcase for Northwest expression. Exhibits at PDX feature the best of our area’s painters, sculptors, photographers, illustrators and other visual artists… but where would Oregon be without its filmmakers? Oregon is home to renowned film festivals in Bend, Bandon, McMinnville and Portland. In 2016, Portland welcomed the fifth annual Northwest Animation Fest. Popular television show like Grimm, The Librarians, and Portlandia film here regularly, and the list of feature films created in Oregon is endless! At PDX, we’re embracing and celebrating film with the Hollywood Theatre at PDX in Concourse C bringing the diverse works of our regional filmmakers to the travelling public. Films screened at the Hollywood Theatre at PDX are short-format programs on a looping reel. That means passengers can stop, relax to enjoy a short film or two and then move along to catch their flights. The sad news? The theater is located post-security, accessible only to ticketed passengers. The good news? It’s free. The microcinema serves the Portland International Airport’s 16 million annual visitors. Ticketed passengers can drop in free of charge to watch films while waiting for their flights. The Hollywood Theatre at PDX features wonderful short films by Oregon filmmakers. Watch all of the current featured films here. The Hollywood Theatre @PDX project is made possible through the generous partnership of the Port of Portland, ZGF Architects, Potestio Studio, PAE, KPFF, Triad Speakers, Erskine Group, Planar/Leyard, Joel Hamberg Painting, Sherwin-Williams, Rejuvenation, Blue Chalk, and Security Signs, as well as the funding support of Travel Oregon, the Fred W. Fields Fund of the Oregon Community Foundation, the Oregon Arts Commission‘s Arts Build Communities program, the Oregon Cultural Trust, and the Calligram Foundation. 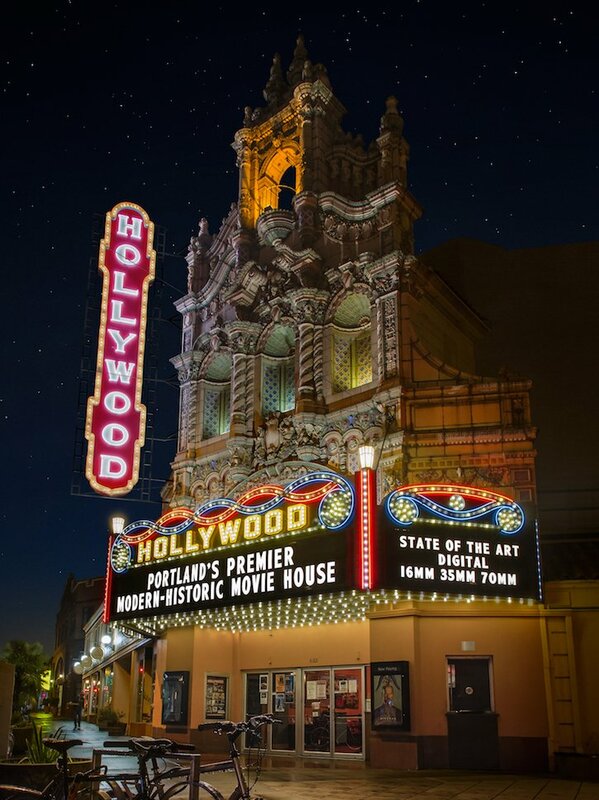 Hollywood Theatre at PDX is now accepting film submissions! For submission details, follow this link. Please direct all questions regarding submissions to Hollywood Theatre at (503) 493-1128. Read more about the Hollywood partnership in the March 23rd edition of the Portland Tribune and also in OPB’s February 2nd broadcast on State of Wonder.